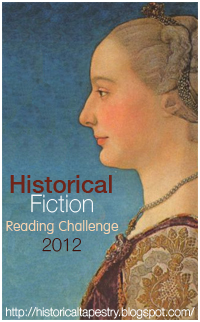 If you head over to Historical Tapestry, the sign up post for next years Historical Fiction Reading Challenge is now up! I am of course signing up for the highest level of participation and so will be aiming to read 20 historical fiction novels next year. The likelihood is that I will read more though! Once again, Alex has done a fabulous job with the button for the challenge! Click on the button below to be whisked away to Historical Tapestry and don't forget to grab the code so that you can add it to your own blog too! This should be a fun challenge - so many different kinds of historical novels to choose from. Have fun! This is one challenge I am considering, as I usually read a few historical fiction novels every year. Thanks for letting us know about this! I haven't read much historical fiction, but what are challenges for other than to expose one to new literature? I'm joining in, especially as I saw The Venetian Affair on the list in the sidebar, which is one I planned on reading in 2012 anyway. Wonderful! Thanks for the announcement! I should probably join this challenge myself... Another thing to do today! Hopefully I can organise myself over the Christmas break to get my challenges organised. Going to set the bar higher this year - maybe 20.